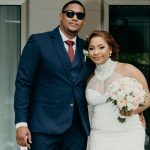 Cavelle and Stanley tied the knot at the serene and exquisitely beautiful lush Zen Garden at Estate 101 in Maraval. They were surrounded by close friends and family members. In front of a stunning floral wall backdrop of hydrangeas, orchids, lilies and roses, Father Steve West performed the marital rites and blessed the union of the couple. The Sustento String Quartet, led by soloist Vidia Nancoo-Harroo serenaded the couple during the open-air ceremony. Guests were entertained on the upper level of the venue during cocktails by the singers Reynold Woodroffe and Debra Bartholomew, who sang in solo and as a duet. The bridal party of seven bridesmaids were bedecked in blush-coloured antique lace, mermaid-style gowns. The groomsmen wore tailored black formal suits, with blush-coloured bow ties and pocket squares. Ebony 104’s Jillian “JD” Gibbs served as Master of Ceremonies while Xavier Strings entertained guests during dinner and for the festivities. Comments such as “breath taking”, “tastefully done”and “out of this world” were expressed by their guests, who all left with wonderful memories of a truly enchanting evening. On Monday 22nd May, 2017 the newlyweds embarked on a month long European honeymoon.